According to the National Highway Traffic Safety Administration (NHTSA), almost one-third of all car accidents are single-vehicle events. Although many people believe it’s impossible to make a personal injury claim after a single-vehicle crash, there are actually a number of circumstances in which seeking compensation may be appropriate. If you were the passenger in a single vehicle accident, you’re allowed to seek compensation from the driver. Auto insurance policies will pay for injuries caused to passengers in the vehicle regardless of whether or not an accident involved multiple drivers. Unfortunately, the right to collect damages as a passenger is limited if you’re injured by a family member. Complications can result when the passenger is a relative living in the same home as the driver. In this case, the passenger is typically considered an insured person on the policy and barred from recovery. Insured persons can’t pursue a liability claim against the policy that insures them. 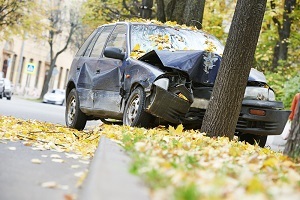 Some accidents that are considered single vehicle crashes actually involve a second driver. For example, consider a situation in which you encounter a vehicle that suddenly swerves into your lane; you hit a tree as you’re trying to avoid a more serious collision. Even though the second driver’s vehicle never touched your car, he would be liable for your injuries. Potholes with large chunks of blacktop or asphalt missing from the road. Oil and chip areas that become slippery after being left on the road for too long. Missing or damaged road signs. Vegetation that is overgrown and obstructing the view of necessary road signage. Erosion damage that isn’t repaired in a timely fashion. It’s possible for multiple government agencies to share responsibility for road maintenance, so you’ll need to consult an attorney to better determine who might be liable in this type of situation. When you take your car to a mechanic for repairs, you expect them to be performed in a safe and effective manner. If you’re later involved in an accident caused by a faulty repair job, the mechanic can be held liable. Neglecting to perform the requested work. Neglecting to properly inspect the vehicle to make sure the repairs were performed correctly. Incorrect diagnosis of the vehicle’s mechanical problems. Causing incidental damage to the engine while making repairs. Leaving foreign objects or debris in the vehicle after making repairs. In rare cases, auto accidents can be attributed to a flaw in the vehicle’s design. When this happens, the manufacturer can be held responsible for injuries. Airbags failing to deploy when they should or deploying when they shouldn’t have. Broken or stuck accelerator controls. A defective electrical system resulting in a vehicle fire. Cracked or broken wheels that cause the driver to lose control. The best way to protect your right to compensation following a single-vehicle accident is to collect as much evidence as possible to support your claim that you’re not at fault. This includes preparing a written statement describing the accident, taking photos of the accident scene, and getting the contact information of anyone who witnessed the incident. You’ll also want to keep detailed records of your medical treatment and accident-related expenses so you have a clear total of your damages to include in the claim. Rechtman & Spevak is committed to helping Georgia residents receive fair and timely personal injury settlements. Please call to schedule a free, no-obligation consultation one of our car accident attorneys. Is It OK to Talk to an Insurance Company After a Car Accident?